The day-brightening kale salad at Scenic Route Bakery. That stretch of cloudy, drizzly days last week had me craving some brightness, and since the weather was clearly not going to cooperate, I opted for a more surefire way to lift my spirits: lunch at the Scenic Route Bakery in the East Village. Is there a lunch spot in this town with more windows? Floor-to-ceiling panels sparkle along East Locust Street and East Fourth Street. If all that natural light — plus the playful displays of vintage kitchen gadgets — doesn’t help lift your spirit, nothing will. 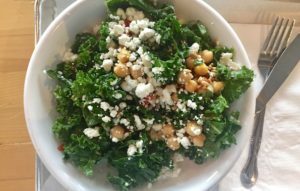 I opted for a kale salad, and I loved everything about what came to the plate. The bite-size kale leaves glistened with a coating of a sprightly red-wine vinaigrette, and I especially appreciated the way every ingredient came in judicious amounts tossed throughout the salad: small slivers of roasted peppers here and hearty garbanzo beans there, with a delicate scattering of sunflower seeds dotting the leaves. The neatest trick of all: As I forked into the salad, the crumbles of goat cheese — creamier and with a more subtle tang than the feta that a lesser chef might have used — softened and melded onto the kale leaves. Suddenly, rough, sturdy (and yes, sometime joyless) kale became luscious wonder. Scenic Route Bakery is at 350 E. Locust St.; 515-288-0004; scenicroutebakerydsm.com. A commitment to good health combined with great taste.